I'd like to think that you can judge how good a sandwich shop is by the level of Awesome in their Reuben. You may agree, you may disagree. No matter what it is to you, in my world that's the straight-up truth. "What in the h-e-double-hockey-sticks made you want to talk about sandwiches?" Simple: 2 hungry people, 1 local sandwich shop. Mike had tried this newer-ish deli out a few weeks ago with some friends while I was off on my road trip and insisted that I try it soon, so when we realized that it was well into lunch time and we hadn't yet eaten any food today (I may or may not have filled up on coffee), he suggested venturing to Sam's Place. See what others are saying about Sam's Place! Mike ordered himself a California Club with a side of potato salad and his traditional beverage, Dr. Pepper. 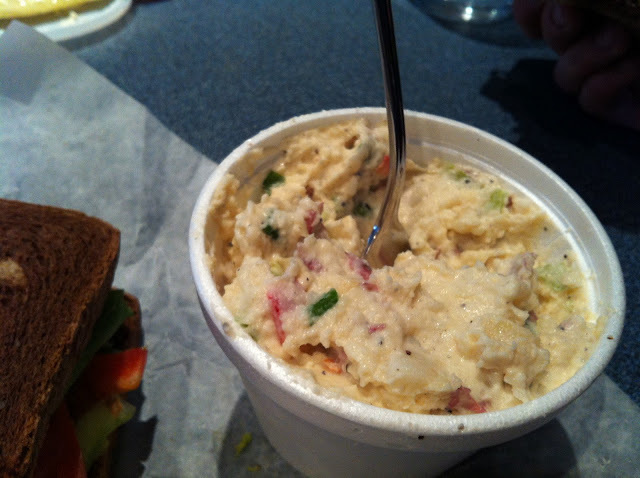 I had to steal a few bites of the potato salad because it's one of my favourite foods and, surprisingly, so few people can make it delicious for my mouth. Well, they have a winner. Super-delicious potato salad. Sorry 'bout the fork - I was dodging the hungry man eating his sandwich. 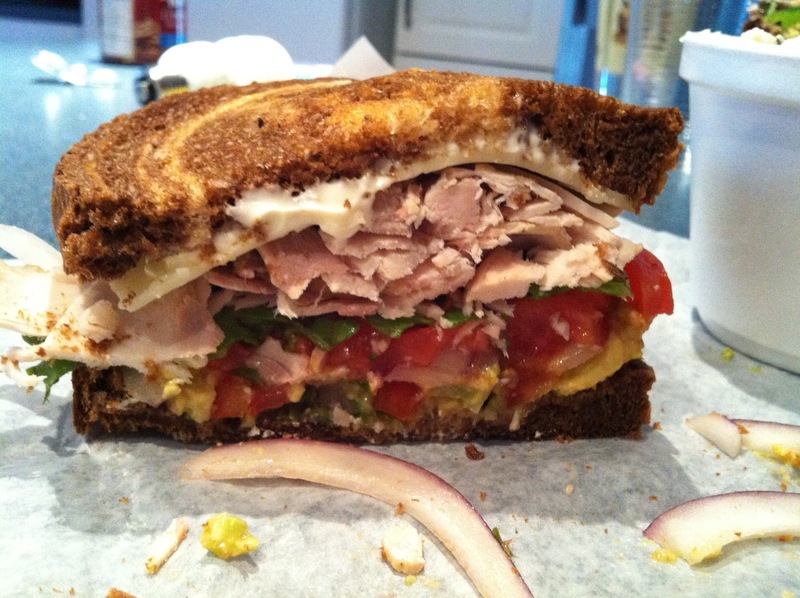 California Club - Avocado, Turkey, Mayo, Cheddar, Bell Peppers, Red Onion, Lettuce & Tomato on Marble Rye, served cold. I, of course, ordered the Reuben. I'm ashamed to say it, but I was so hungry and the sandwich was so good that I honestly completely forgot to take a picture of my sandwich until my last bite. But no worries my fellow foodies - I will be going back to have another so I will be sure to add a photo when I do! I would easily give it a 10/10, yes indeed I would. The only complaint that anyone may possibly have is that it's not a mile-high Reuben, which some people swear is the only way to eat them. I disagree with that, and think that it should be the perfect blend of all of the flavours. And, my friends, it was. Ohhhh was it ever. And for that reason, 10/10 it is. While we are on the topic of Reubens, I should probably toss you this gem, a whole website dedicated to the most amazing burger recipes including "The Brooklyn" (page 24, "The Inaugural 30") which is probably the greatest burger/sandwich creation of all time. I sh*t you not. Yes, we did make The Brooklyn. Yes, it was even more amazing than it sounds. *Our variation: We used President's Choice Prime Rib frozen burgers (I know - cheating, but they're SO GOOD) and they were probably sprinkled with some seasoning salt and slathered with one kind of BBQ sauce or another. The Swiss Cheese was just whatever our grocery store had, and we used marble rye instead of dark because someone around here really loves fun-looking things. Including bread. Next time, I'd make it with fresh bacon burgers because bacon should always be included. Always. In conclusion: if you're in Peterborough or will be visiting any time in the near-ish future, you have to check out Sam's Place. You won't be disappointed. And if you're not ever around here, you had better make The Brooklyn. Or you could just do both. I vote both. If your love for a good Reuben matches mine, leave a comment sharing where you had the best Reuben and what made it so Awesome!